Have you ever wondered what those people are doing out in the middle of the water, standing on giant surfboards with a kayak paddle, out in Jericho beach, English bay or False Creek ? Do you ever imagine yourself gliding across the water, masterfully standing on your paddleboard, soaking up the sunshine and connecting with the moment? In Vancouver, Standup Paddle boarding, also known as SUP, is one of our favourite summertime water activities, and it’s easier than you think! Is Stand Up Paddle Boarding (aka SUP) for me? If you’ve ever seen any “old school” photos of beach boys (or girls!) 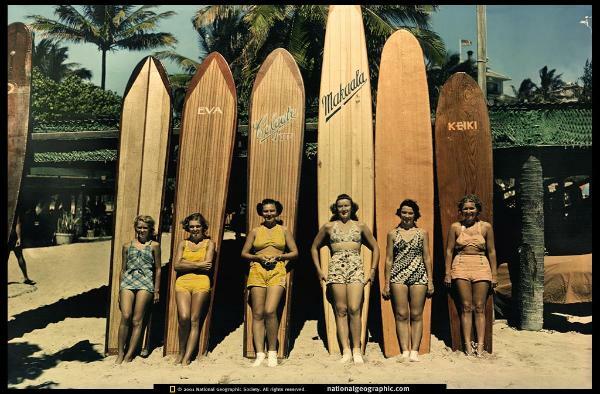 standing in front of their towering surfboards (ten or twelve footers), that’s sort of what you will be using. Paddle boards are constructed differently than surfboards, which allows you to stand on, balance and maneuver much easier. Within an hour, you can feel comfortable, balanced and experience the element of mastery. The activity is no impact (unless you consider jumping into the water low impact) and tons of fun, so you’ll see everyone from kids to older adults out on the water. I would only recommend not trying this if you really dislike water. But then again, you probably won’t be be reading this blog! From a fitness and kinesiology perspective, I love that the relaxed nature of paddleboarding (for beginners) allows you to consciously focus on several aspects of your body. For example, trying to stand up tall is an opportunity to practice postural alignment in a dynamic setting. Imagine standing on a waterbed (does this show my age?) for an hour or so. Part of standing tall on a dynamic surface is loosening up your quadriceps muscles to work them in a shock absorbing manner. Typically I notice a lot of clients will unconsciously lock their knees while standing, causing an over-contracted, tension in the thighs. Over time, this could lead to knee, hip or back pain (if you want to get into the kinesiology of it, let’s go for coffee!) and weak thighs. Booo. If you’re aware of your posture (or being constantly reminded to be, by your trainer), tight upper traps, or neck tension is probably an issue. With paddleboarding, you have to consciously be paddling on both your left and right sides, so shoulder mobility is important. Imagine trying to navigate with your paddle, while your shoulders are scrunched up by your ears. It’s so much easier then your neck and traps are relaxed, and less painful. Plus, it might help to know that your balance won’t improve with tense shoulders. Surprising, I know. People often ask me if SUP is good for your core. This depends on what one’s definition of “core” is, but cutting to the chase, paddle boarding will not give you a 6-pack. The great news is that you have a fantastic opportunity to ask your abdominals to create stability and minimize rotation in dynamic setting due to the balancing and bilateral paddling motion, which is a different motion than traditional crunches or exercises like the plank that people use to work their recuts abdominus. Did I just go all weird jargon-sepak? Sorry, the 6-pack muscle. (But I have a feeling you guys already have heard of that ~ smart cookies!). Really, the bottom line for those new to Stand up – it really is true, you’re exercising and don’t even know it. I won’t lie and say that it’s a “better” workout than a 10K (or maybe even 5K) run, or that it replaces strength conditioning and weight lifting, but it brings an element of play, connection and functionality to a healthy cross training program. And I’m all about playing and having fun! Like most Vancouverites, we like to get out when the sun graces us with it’s presence. If you haven’t been getting regular exposure to UV rays, the water reflects the rays back at you, and you could get quite sunburned. You could be having a great time on the water, with the cool breeze and having fun, so you might not notice how much times you’re exposed or that you’re burning even if you don’t feel hot. If you’re concerned about UV exposure, which ultimately depends on time of day, length of time you’ll be in the water, amount of time on your stomach or where you are paddling in the world, wear a long sleeve “rash guard” style shirt. This helps if you might accidentally spend a lot of time in the water (aka falling off your board) and might wash or sweat off your sunscreen. If you choose to wear your shades, be mentally okay parting with them, or invest in those super cool rubber sport straps. I definitely recommend bringing sunglasses, even if it is overcast, as sometimes the weather can change in the blink of an eye (see what I did there), and the glare off the water can damage your retinas. Wear a life jacket! Actually, this is a requirement in BC. Depending on the board rental company, if your paddle board comes with a leash, keep it on your ankle until you exit the water with your board. This is a safety point for not only you, but your friends in the water, too. Remember if you slip off and fall backwards, your board might go shooting forwards and right into someone. 5) Swimming lessons before SUP? You don’t NEED to be able to swim, as your board and life vest act as your flotation devices, but I’m a big fan about safety and suggest staying in shallower waters, or ensuring that you are with people that are trained as lifeguards. For example, in Maui, you could paddle board to your heart’s content for a couple hours in waters shallow enough that if you fell in, your feet would touch the bottom and the water might be at chest level. You can wear a t-shirt, tank top, athletic shorts or a swimsuit/ bikini bottoms. Beach stuff! You actually don’t need special footwear to paddle board, go barefoot! But depending on the beach (sandy, rocky, sticky, pointy, icky, pebbly, painful…) you may want to have water socks, and some rental places will have them available for an extra fee. If you’re in doubt, just ask the staff at the rental place, they can make a recommendation if you need them or not. One of the companies in English Bay rents SUP boards right on the beach, which means barefoot all the way! In Maui, I had to carry my paddle board across a street, across a football field, a park, to the beach, then finally into the water. Sandals? I think so. If you’re only going for an hour or so, don’t worry about packing water with you, just hydrate well before and after your paddle. And no, “drinks on the patio” (aka alcohol) don’t count! Nice try! 9) Where do I keep my stuff while stand up paddleboarding? Just like a day at the beach, or pool, bring a towel, change of clothes, more sunscreen, drinking water. Check ahead of time to see what kind of lockers are available if you are rending a board from a SUP or kayak rental company. If their facilities aren’t big enough for all your things, (shoes, car keys, smartphones, lunch…) then look for an alternative lockup at the beach, or keep items in your car. 10) Will I get wet while doing SUP? I hope you get a chance to try Stand-up paddleboarding – it’s an amazing fitness activity to add to your repertoire, and a beautiful compliment to personal training sessions. If you’re really bold, give paddleboarding plus YOGA a try! Pair the zen of the pigeon pose with water, or the bow on your board. But I digress, maybe you should just come out to one of Vancouver’s best beaches (like English Bay! ), bring your friends and try it. Welcome to the amazing world of SUP! Thank you for the reminder to get wet! I know that the few times that I’ve tried paddleboarding I always fight getting into the water because I want to be successful in staying on. Falling off and being in the water is part of the fun, and I’m sure when you take away that stress, it would be easier to just get on and stay on too! I’ll definitely make sure that next time I loosen up, get in the water, and make sure to have fun while I’m paddleboarding. My friend and I are trying to plan our spring break this year and are thinking of renting some SUP so that we can go on the lake. You mentioned that when newbies are paddling they should wear long sleeves since it helps with UV exposure if you end up being on the water all day. That is a great point for me to remember so that I can pack before the trip. Excellent article! It has really helped me in starting my paddleboarding adventure. Kudos to the poster for such an amazing post!